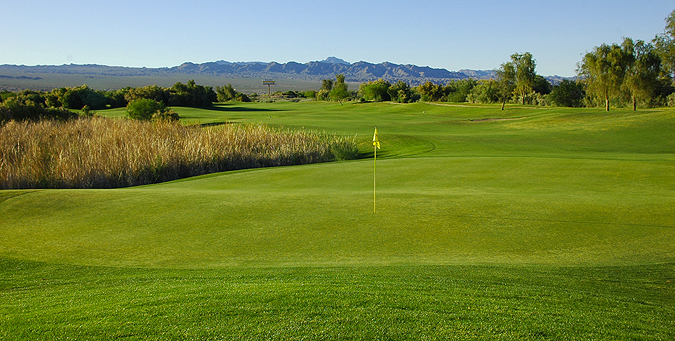 The Mojave Resort Golf Club is considered the premier layout in Laughlin - a 6939 yard championship course that has been honored with 4 stars from Golf Digest Places to Play. A wide player friendly design along a terrain that combines native vegetation and wind swept sand dunes, with outstanding conditioning - is what golfers will find on this daily fee course. Built in 1997 and designed by the Curley and Schmidt team, Mojave features strategic bunkering and unique natural areas that will challenge all levels of golfers - but also presents 4 sets of tees so all levels of players can choose their medicine. From 6435 yards with a 122 slope rating, scratch golfers will find the Championship tees interesting but playable. 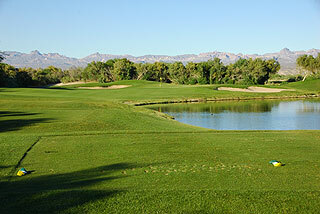 Average and high handicappers will a fine resort golf experience from the middle tees at 5959 yards/115 slope. Ladies will also find the forward tees accommodating at 5520 with a 124 slope rating. TaylorMade rentals are available in the pro shop, and cart and range balls are included in all green fees, which are under $100 all year long. The practice area consists on a grass range with target flags, putting green and a short game section with sand bunker. A snack bar and lounge serves breakfast And lunch items and all the favorite beverages, with seating indoors and on an outdoor patio that provides nice golf course views. The Pro Shot GPS on each cart provides measurements to the front, center and back of the greens, along with yardages to and over the many fairway bunkers that line the course. 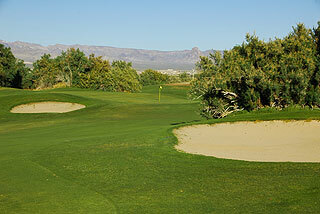 The fairways at Mojave are forgiving, and on our round in mid-April - were well manicured. The putting surfaces were in great shape, and of medium size and speed with mild slopes and undulations. The key to scoring well here is to avoid the many strategically placed fairway and greenside sand traps, along with the natural desert and unique marsh areas. We found the opening nine to be extremely playable - and the back side to be a bit tougher, with bunkers that come more into play and tighter green complexes. 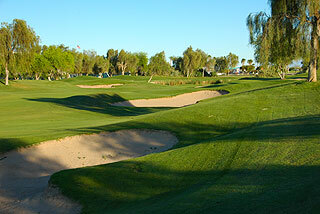 The opening hole presents a wide fairway that slopes right to left, with an uphill approach to a simple green complex. There is plenty of room between the fairway and greenside bunkers on the short par four 2nd, supporting a grip it and rip it mentality which may enable you to drive the green. Most players will be left with a wedge to a raised and undulating green. A tee shot placed just left of the right fairway trap will create good positioning and a great scoring opportunity on three, which features a beautiful mountain backdrop. There is lots of room for error near the green. The fairway tightens past the left fairway trap on number four, but long hitters should be able to fly the left edge of this bunker, leaving a simple uphill approach. A beautiful par three follows on 5 - with the water hazard along the right primarily there for aesthetic purposes. Number six is a challenging par four, with a tee shot placed just over the right edge of the fairway bunker the preferred play. Those landing on the right side of this left to right sloping fairway may want to consider laying up to within wedge distance and playing for a tough par/easy bogey - as this green complex is wedged between patches of natural desert vegetation. There is plenty of room off the tee on 7, though the most advantageous approach will be played from the left side, effectively taking the marsh out of play. 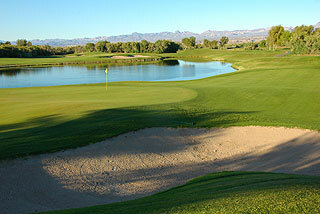 This natural area squeezes the fairway and comes into play immediately right of the green. There is water short right and a bunker left, but plenty of room short left and past the green on the par three 8th. Number nine is nicknamed the Brute - and this 438 yard par four is just that. The safest tee shot will land just in front of the right fairway bunker, as the marsh along the left comes into play on that side from about 120 away. This hazard makes for a tight approach, as it rests immediately left and also long of the green. Number ten invites a tee shot over the right edge of the center fairway bunker. If short of the green on your approach to this mid range par five, a bump and run is a good option from the abundant fringe area that fronts the putting surface. The par four 11th is well bunkered from fairway to green, with an uphill approach to boot. The safe approach is short left. Another well bunkered fairway awaits on 12, with the right center being the best location to approach this challenging, raised green. To score well on the par five 13th one must avoid the fairway traps off the tee and the desert waste area on the right which comes into play about 115 yards out. A lay up in front of the left side bunkers on the second shot, about 80 yards away will leave advantageous position for an easy wedge to the green. The par three 14th plays long, and left is gone as the dunes quickly come into play on that side. Fifteen is wide open off the tee, and the left side of the green complex is free of traps and swales, creating a good area from which to bump and run one onto the putting surface. Water is in play on the right about 110 yards from the green on sixteen. A tee shot aimed left center will slope down towards the right, with the 100 yard area a good location. Pay attention to the pin placement, as this green is double tiered. 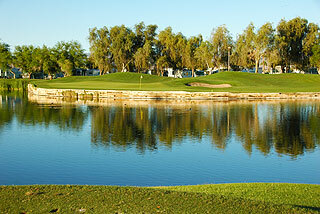 It is better to be long on the par three 17th, which is all carry over a pond. The mounding in back may funnel shots onto the green - take enough club as there is a prevailing headwind, and this hole plays more than the yardage advertised. Eighteen is a tough proposition from the back two tees, which demand a long and accurately placed tee shot to a narrow fairway with water all along the right side. The second shot is also challenging, with the hazard again requiring a carry. There is room short right for those wishing to play it safe for a possible up and down. Mojave is wonderfully designed, with a great variety of shot options presenting the possibility of using every club in your bag. The mountain views, unique wetlands and dunes, and abundant native vegetation and wildlife make this a memorable experience. 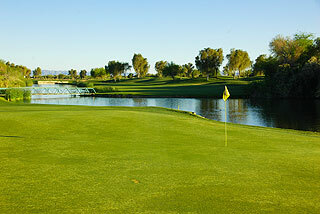 On our visit, the course was in great shape from tee to green, and the staff was courteous, friendly and helpful. 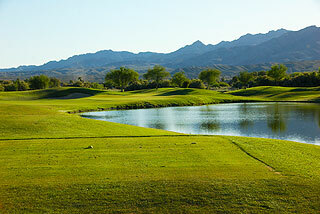 If in the Laughlin area - this is a must play course. Packages and discounts are available through a number of hotel/casino properties in the area. Avi Casino is just minutes away from the golf club - for more info on the Casino and resort click here https://avicasino.com. 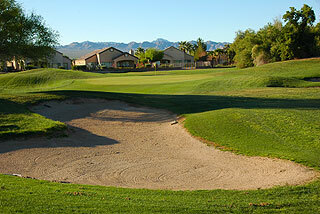 For our informational page and a web link into the Mojave Resort Golf Club web site - click here.